When you want to sell your home, pick neutral colors. Chestnut brown is a classic choice, like the light oak hardwood pictured above (Oak Roccia from Kährs). Trendier colors are gray and lighter tones, such as sand. 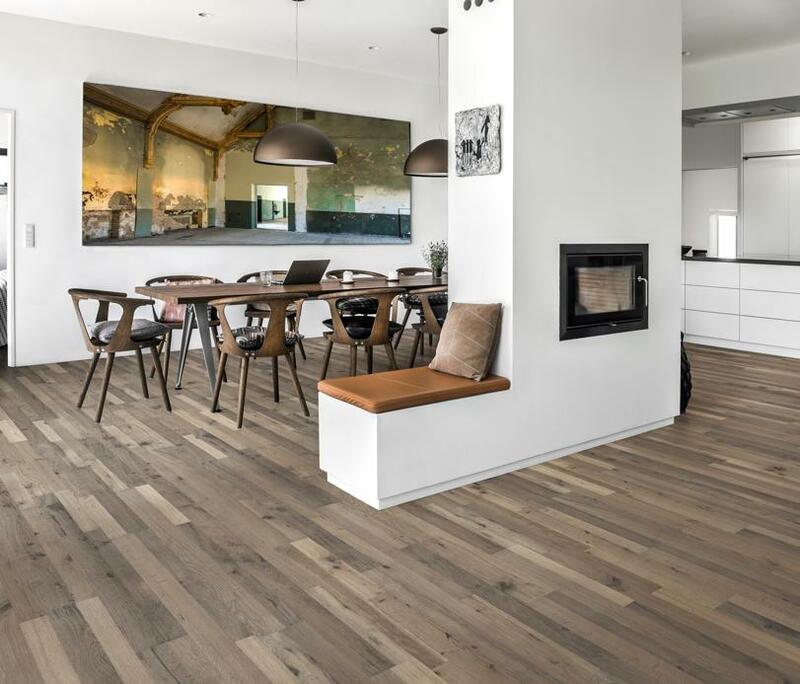 The light-colored flooring seen at left (Oak Vista, a hardwood also from Kährs) is a popular example. Wide-plank flooring is also trending, but you need a minimum square footage per plank width or an open layout to pull it off. Did you know your shoes can influence a person’s first impression of you? (You wouldn’t wear sneakers to a wedding, would you?) Well, the same can be said when it comes to your home’s flooring. If your home is sporting worn, outdated, or dirty floors, you run the risk of turning off potential buyers and leaving money on the table. That’s why flooring is one of the first areas we address during a home staging consultation. Ideally, your floors will be buffed and clean, but sometimes they are beyond repair. What is the look that sells, and what rooms should we focus on? In the Northeast, the material and most popular look that sells is hardwood flooring. Ideally, it is throughout the first floor and in the master bedroom. Is carpeting OK, or should we tear it up and install hardwood? What is the average price of flooring? According to Steve Messina of J&S Carpet Co. in Belmont, new carpet costs about $6 a square foot, including materials, labor, and removal. Hardwood flooring installation: $9 per square foot for jobs that are more than 500 square feet and $12 per square foot for those less than that. This usually includes the cost of materials, installation, staining, and two coats of polyurethane. Hardwood flooring can also be finished and stained at the mill and then installed. This saves the aggravation of having to evacuate your home for several days while the stain/polyurethane dries. Pre-finished engineered flooring: $12 per square foot. This comes stained and ready for installation. 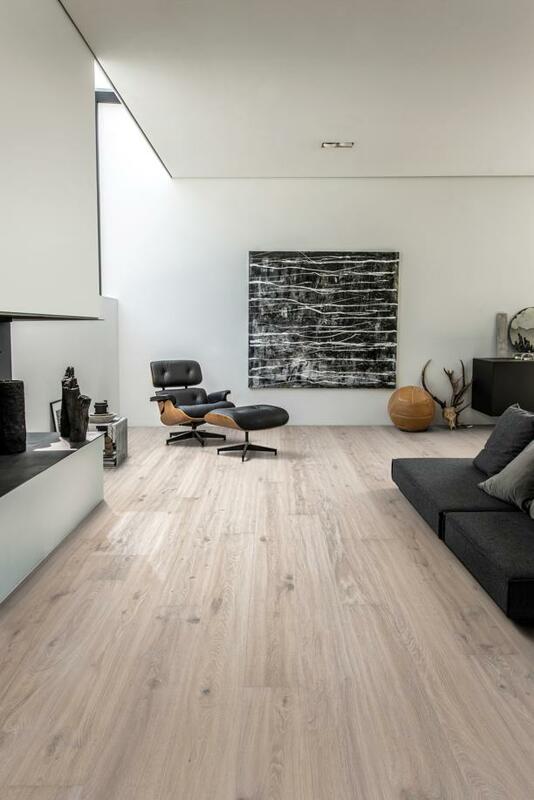 If you haven’t seen engineered flooring lately, take another look. It once had a reputation for looking fake, but that is no longer the case. It is easy to install and can be a great option for updating the floors easily and quickly. The major advantage to an engineered flooring option is that it can be installed over concrete. This is especially helpful for those who live in apartment buildings. What color or stain should I use? Stay neutral. Remember, you are marketing your home and want to appeal to a broad base of potential buyers. Chestnut brown is the classic choice; however, the trendy colors are gray and light tones. I caution you not to use a color that is too light or too gray — a whitewashed beach tone, for example. These trends are more taste specific. What width plank should we go with? Wide planks are the trend. Most rooms will hold a 5-inch plank well. Rooms that are 400 square feet or larger or have an open floor plan can often handle a 7-inch plank nicely. Rule of thumb: The wider the plank, the larger, or more open, the space needs to be. It can be tempting to overlook our floors as we stage our home for sale, but remember, just like when we ignore our shoes and fail to create a polished look, we can give a poor first impression. We would much rather see a client update than place rental furniture in a house with scuffed floors. The end result will not wow (or fool) anyone. Kara Woods, a home staging and design professional who specializes in the luxury market, teaches at the Academy of Home Staging and serves as Northeast regional vice president of the Real Estate Staging Association. Send comments to Address@globe.com.